While planting vines late one evening in spring our attention was caught by a movement at the top of the gully – the small valley that divides our vineyard. The animal was unexpectedly large and reddish gold in the last flashes of sunlight. A fox maybe, or a faun? Then it gave a bound and disappeared into the long grass, revealing itself to be a native brown hare. We were immediately excited to see such a shy creature, then suddenly anxious when we realised that it must be nibbling on the first soft leaves of our fledgling vines. With each subsequent visit we noticed the sharp snip of neatly nibbled leaf stems and crazy mudprint patterns as it scampered over the plastic mulch after rain. We have 1800 vines, but this was a busy hare, out and about from late evening to early morning when our backs were turned. We considered fitting rabbit guards which would be expensive and time consuming. After a little research we were reassured that our Lepus europeaus was not going to be the advance party of a hoard of invaders. A female hare has a few leverets per season which are largely left to fend for themselves in a nest in long grass, making them vulnerable to predators such as birds of prey and foxes. We feel fortunate to share our vines with such a beautiful creature. 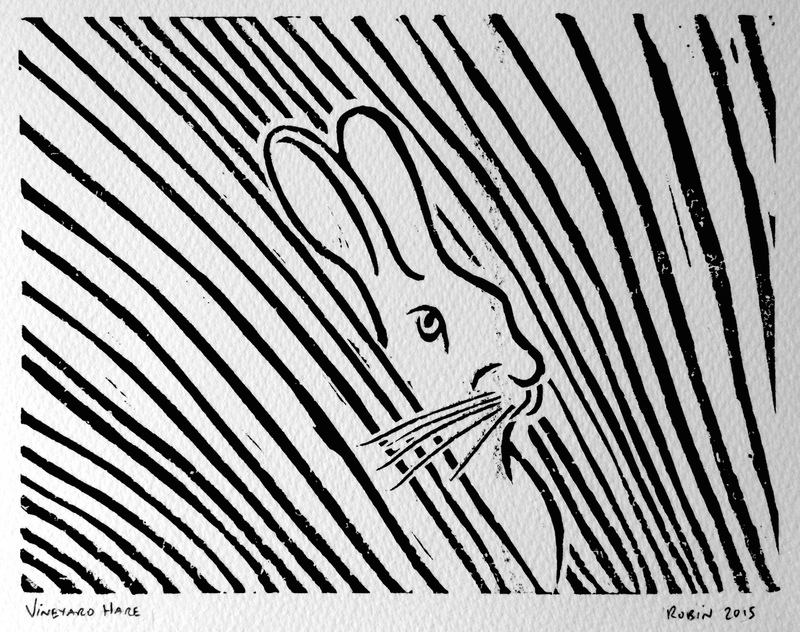 It is said that hares and vines were both introduced to Britain by the Romans, making them companions of old. As a traditional symbol of fertility, may the golden hare bring us good crops in the future.